The Northern Bailey Range Traverse is seldomly traveled by hikers. It is the true start of the Bailey Range to the north at Boulder Peak and the section ends at Appleton Pass, where it continues to the next section to Cat Basin and leads to the Catwalk. This is the what we traveled on this hike. During our hike we started at Lake Crescent and walked up and over Aurora Ridge. The next day we hiked to Boulder Lake and made our ascent to start the Bailey Range Traverse. In my opinion this is the steepest parts of the full traverse. Keep that in mind if you have trouble traveling over this kind of country. This is first of August, during a heavy snow year. We did not follow the exact route in the Olympic Mountain Climbers Guide. My partner had comfort level issues on the steep snow fields above Mud Lake and the col on the West slope of Mount Appleton. We ended up traversing around these, putting us on a not so fun route following elk trails out of North Fork Sol Duc Basin. My thinking while route planning, was to do the more physical part first; which was the traverse sections. 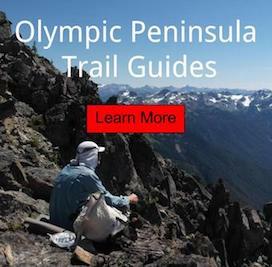 Then spend the rest of the allotted time lounging in various destinations in the Olympic Mountain backcountry. Little did I know that it would turn out completely flip flopped from the original itinerary. A handful of weeks after setting up the original plan. I had sent an email to my friend inviting him to at least the first two weeks of this trip. He had voiced to me originally that he planned to backpack the Sierras that summer. Once time got closer, I got an email that he was very interested in joining the whole adventure. He mentioned that a project on the chalk board could come to light by doing such a trip. I agreed and was excited to get started. He has lots of knowledge about backpacking and I'm always eager to learn more skills. My mistake at that point was not adjusting the original itinerary to something that was more practical for the group. During my solo hikes I usually will travel 10 to 15 hours a day on the trail comfortably, but a schedule like this would exhaust most hikers. Would also learn that we have almost completely opposite hiking styles and reasons for spending time outdoors. Proud to say through such adversity we will got along great the whole trip. He is also awesome in being so flexible to my hiking style and would go until full batteries ran out daily. Not to many people out there would do that in these conditions. Even woke up every morning with a smile on his face. Starting at Lake Crescent the route would lead to Boulder Lake the official start of the Bailey Range Traverse. From Boulder Lake we would use only game trails and traverse over to Appleton Pass which is on the Southeast side of Mount Appleton. Once to this Pass, we would be on a more traveled section of the traverse called Spread Eagle Pass. This would side hill from Appleton to the Cat Walk; which is the more popular entrance to the main portion of the Bailey Range. This was a warm section for us since it was blue bird weather for weeks; which is rare for the Pacific Northwest. Water consumption became the primary task. I got to know my Sawyer Squeeze System very well. In the trips past found out that the bags that come with the system are disposable; so don't plan on using them longer than a trip or two. They are prone to springing leaks. During the Mount St. Helen's Trip I used the Platypus 1 l bottle, but have problem sealing because threads do not match up. You can however make it work with some patience and a keen eye. While hitch hiking for the second time during this trip a man offered me bottled water. Aquafina 1.5 l to be exact. After some time it hit me that it shares the same thread pattern as the Sawyer Bags. I used this for a week without no problem. A tip is to take a few drinks then release the air by unscrewing the filter slightly so not to crush the bottle. This will increase the longevity of the plastic. While navigating one of the many drainage in the afternoon. He took a series of slips and stumbles. One of which smashed his Nikon into a boulder field; doing $2000+ worth of damage. Making 10 lbs+ of his backpack dead weight. This was a huge mental burden; since he has such a love for photography. While we walking down the Cat Walk, I could tell that the mental burden from the fall the day before was taking its toll. Even tho he was willing to continue; I refused to go into this section of the trip unless he was at 100%. So I alone made the call to turn back, hitch hike to town, mail back his broken equipment and get back on coarse. I felt that this was the best choice in finishing the rest of the Olympic National Park loop that has been planned for so many months. He wasn't happy at me for about 48 hours and disappointed about losing his camera, but I didn't care. Finishing the whole thing mentally and physically healthy was the most important. The whole situation would drain heavily on me mentally in the next coming weeks. Since this section was the whole reason of me planning this trip. I'm positive the whole thing has made me a stronger person in the long run and that is one of the gifts of being in the wilderness. So looking at the big picture was a win - win. Next page of our adventure across the mountains of 30+ Days in Olympic National Park.